If you live in Des Moines, IA, and are looking for a quick and affordably priced way to update a bathroom in your home, we invite you to consider the excellent selection of low-maintenance acrylic bathtubs that are available through U.S. Patio Systems and Home Remodeling, a local bathroom remodeler and authorized Bathwraps-brand bathtub dealer. 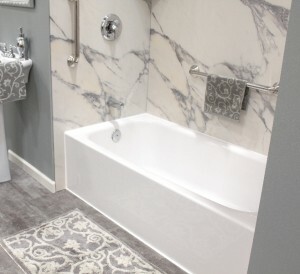 The bathtubs that we install in and around Des Moines are made of 100 percent American-made acrylic, a low-maintenance, non-porous material that provides exceptional durability and beauty. With styles, sizes, colors, and accessories to match virtually any budget, we are confident that you will be able to find the perfect tub simply by picking up the phone and calling U.S. Patio Systems and Home Remodeling. The installation of a replacement tub from U.S. Patio Systems and Home Remodeling is a cost-effective way to ensure that you are able to get more enjoyment out of your bathroom space. Contact U.S. Patio Systems and Home Remodeling today for information about our excellent selection of high-quality bathtubs. In Des Moines, Iowa, we also install shower systems, bathroom cabinets, bathroom flooring, mirrors, light fixtures, and more.